April was National Poetry Month, and over the past month we showcased a number of our poets, including our T. S. Eliot Prize for Poetry winners. Below are a few of the poets, and their poetry collections, that we featured this past month. Clink on the title to connect to the book’s page on our website. 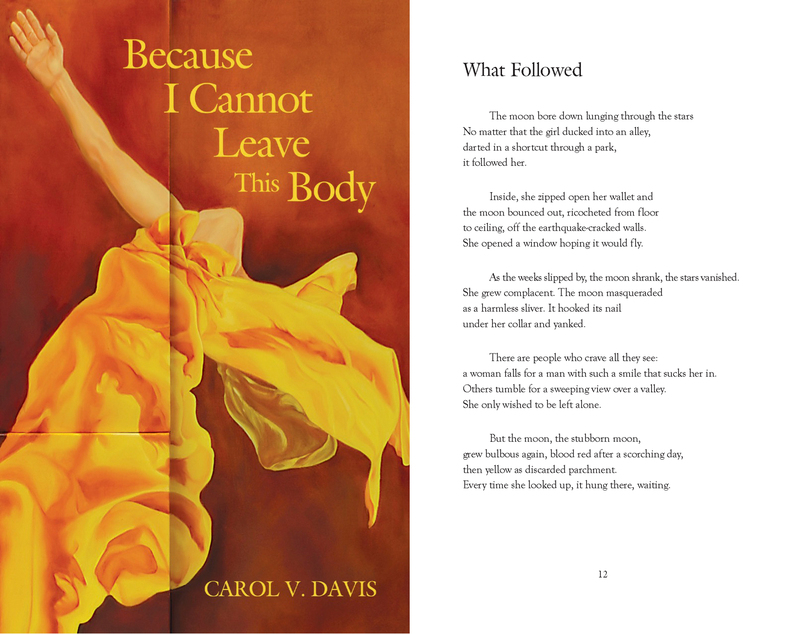 Because I Cannot Leave This Body by Carol V. Davis was published in 2017. She is twice a Fulbright Scholar in Russia and has published two other poetry collections with TSUP, along with her collection Because I Cannot Leave This Body. One of those collections, Into the Arms of Pushkin: Poems of St. Petersburg, won the 2007 T. S. Eliot Prize for Poetry. Davis’ poetry has been highly praised and read on such outlets as NPR and Russia Radio. Mud Song by Terry Ann Thaxton was the T. S. Eliot Prize for Poetry winner for 2017. This poetry collection was also awarded the 2017 Florida Poetry Book Review silver medal. She is a professor of English at the University of Central Florida in Orlando where she teaches creative writing and serves as the MFA Program Director. She has also published two previous collections of poetry: Getaway Girl and The Terrible Wife, which won the 2014 Florida Book Award Bronze Medal. 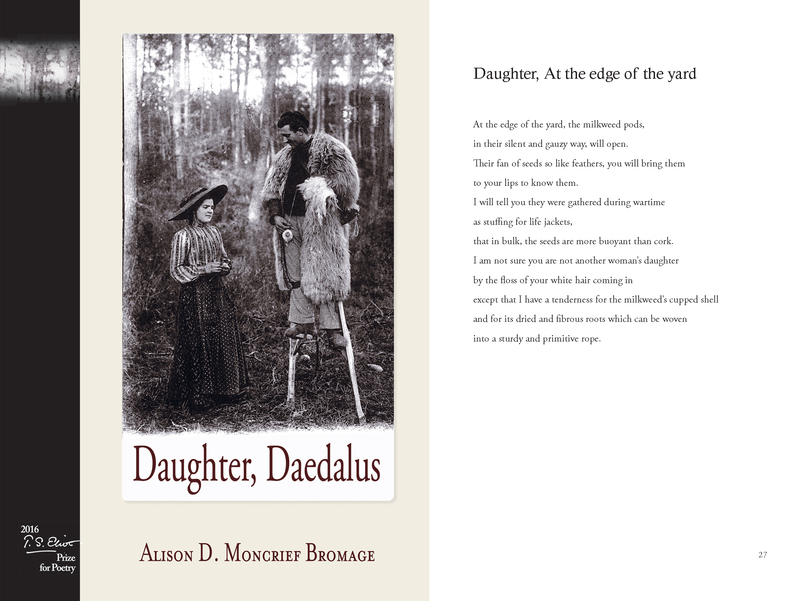 Alison D. Moncrief Bromage’s poetry collection Daughter, Daedalus was the 2016 T. S. Eliot Prize for Poetry winner. Her poems have appeared in The Paris Review, Denver Quarterly, Barrow Street, and other literary magazines. 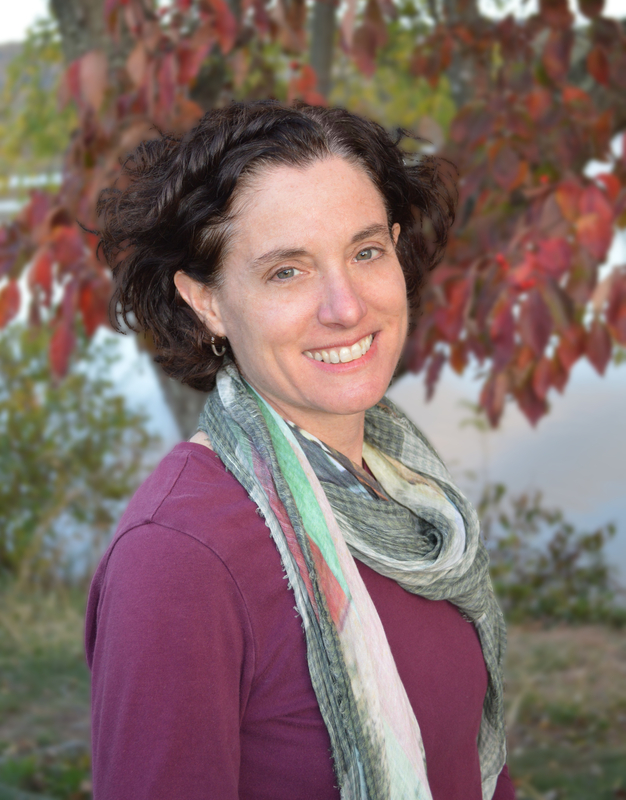 She holds an MFA from New York University and is currently a writing tutor at Yale University. 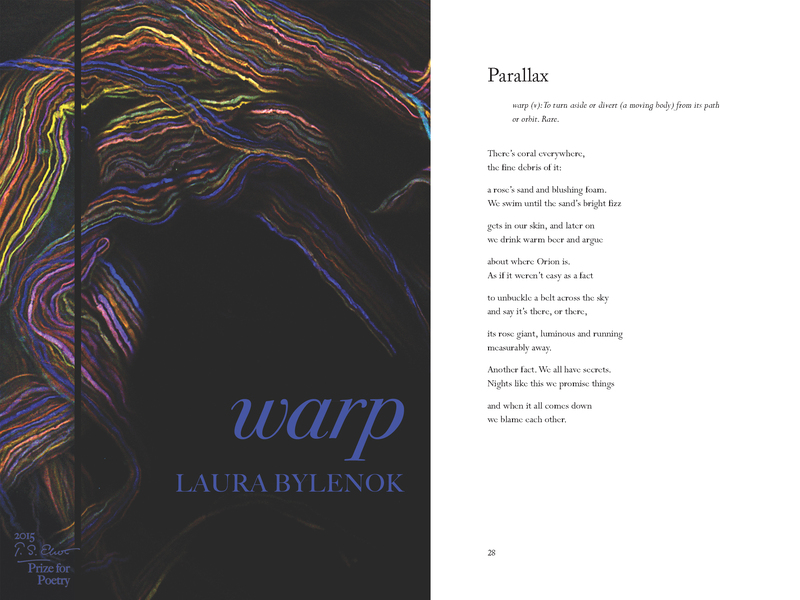 Laura Bylenok’s poetry collection Warp was the 2015 T. S. Eliot Prize for Poetry winner. Her poetry can be found in Pleiades, North American Review, Guernica, Cimarron Review, and West Branch, among other journals. Warp was the Best Book Award’s 2016 “Poetry” Category Award-Winner and a finalist for Foreword Review’s 2015 INDIEFAB Book of the Year Award for Poetry (Nonfiction). 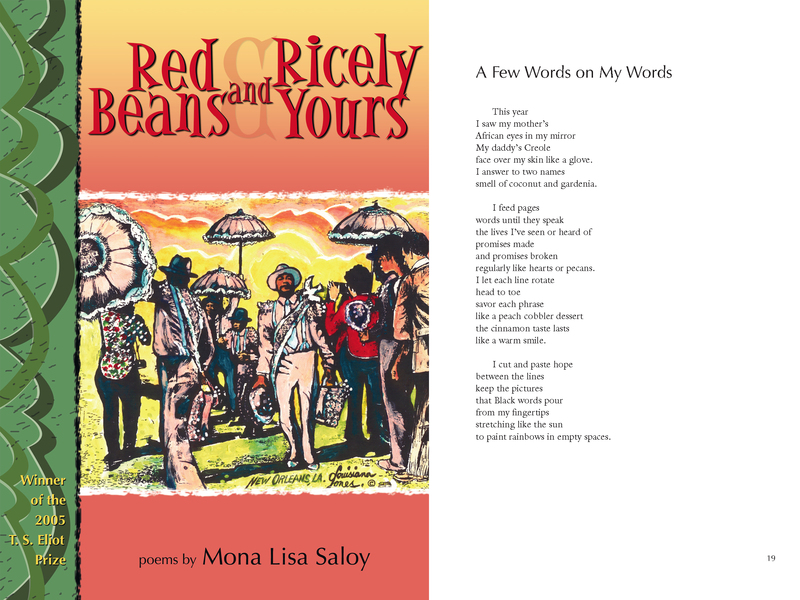 Mona Lisa Saloy’s poetry collection Red Beans and Ricely Yours was the 2005 T. S. Eliot Prize for Poetry winner. Saloy’s collection was also the winner of the 2006 Annual PEN Oakland-Josephine Miles Literary Award for Poetry. Her award-winning poetry collection is composed of narrative poems that celebrate the day-to-day lives of Black New Orleans. Born in Athens in 1928, Titos Patrikios was a member of the intellectual left of post-war Greece, surviving imprisonment, hard labor, censorship, and exile. Patrikios went on to publish five collections of poetry and three books of prose. 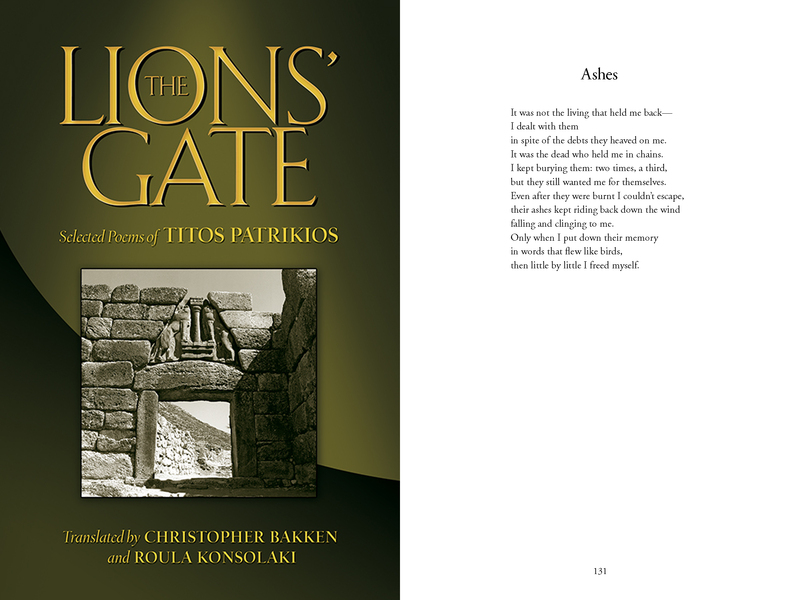 His poetry collection The Lions’ Gate focuses on Patrikios’ hardships and defiance. While his poetry is well known and widely translated in Europe, this collection represents the most complete publication of his work in English, translated by Christopher Bakken and Roula Konsolaki. 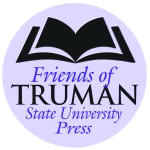 Follow us on Facebook (@trumanstateunivpress) or Twitter (@TSUPress) for more posts about our titles! 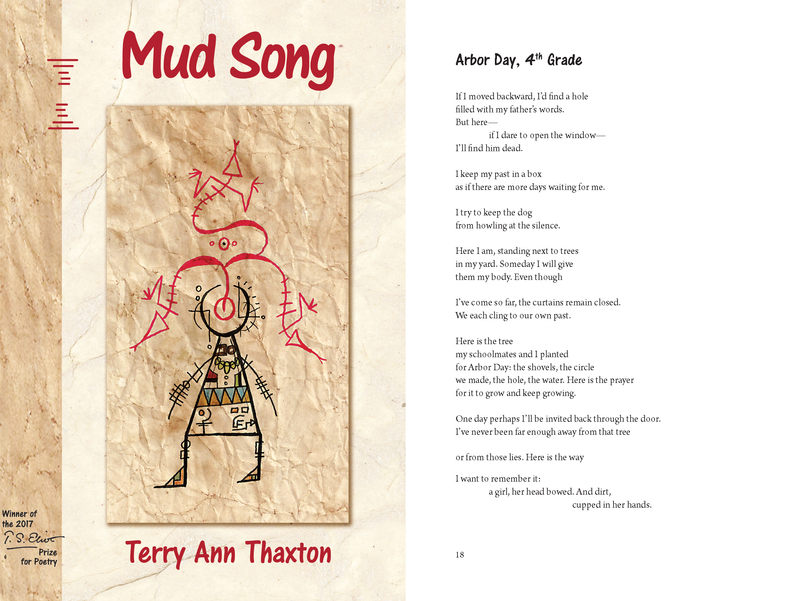 I recently had the opportunity to interview Ms. Thaxton about Mud Song, gathering insight into the memories and the process that fueled this collection. Your poems illustrate a sort of secret life of Florida—one that privileges squirrels over dolphins, mud and sinkholes over sandy beaches, and cardinals over seagulls. How did growing up in Florida help you avoid falling into the trap of describing the state’s landscape in an expected or clichéd way? Florida’s landscape is constantly changing because of development. The construction of gated communities, apartments, businesses, and tourist attractions does something, I believe, to the soul or spirit of a person. No matter where I’ve lived (in Florida), I’ve always driven past some type of major construction on my way to my job. One day there is a lush forest with oaks, saw palmetto, filled with gopher tortoises, snakes, armadillos, boar, and the next day that same rich habitat is cleared to make room for a new subdivision, usually named after what was destroyed to create it; usually something like “Oak Reserve” or “Palm Ridge.” This cuts deep. These sudden changes to the landscape affect my sense of the world. And the landscape is part of who I am. The landscape I know, and spend my time in, is how I know myself. The landscape is my language. The mud, the swamps, the alligators, the birds, the saw palmettos—all of it is part of my being. The memory of your mother takes on a haunting presence in “Say One Word to Me” and a number of this collection’s other poems. What can you tell us about the impact your mother has had on your writing? I never set out to write a poem that includes my mother (or my father, for that matter). She is always there, always an unanswered question. She died fairly young—at 63. I was in my early thirties when she died, and I did not come to know her very well until a couple of years before her death. She knew she had colon cancer, but did not tell anyone until it had metastasized even to her brain. During those years—of her knowing, and none of us knowing—she and I had conversations in which she allowed me into her life struggles. She revealed to me how unhappy she’d been in the thirty years of marriage to my father, who’d died at age 53, eight years before my mother. She shared with me secrets about his life she’d told no one, not even her closest sister. She told me about her wanting to divorce my father when my siblings and I were kids, but she didn’t know how she would’ve financially supported us. This knowledge that throughout my life, my mother had been terribly unhappy is always part of my writing. This haunts me. When I was born, I was told, I had so much hair that that my grandmother said I looked like a possum. At birth my dark black hair met my eyebrows. I had black hair on my arms. Thankfully, the hair on my forehead and my arms fell off quickly, but I always felt like an outsider in my family—and my mother’s joke stayed with me. Though it is my older brother who was adopted, I felt like the child who was not part of the family. I was a girl—that was not good I learned early. Everything felt haunted to me. The first house I can remember living in I refer to as “the haunted house.” One day in that house, when I stayed home from first grade, I was resting in my parents’ bed downstairs—my mother was next door helping a neighbor—I heard something in the garage. I was certain it was the devil. Terrified, I snuck out of bed, and crawled out of the bathroom window, causing all of the items on the windowsill to fall out onto the ground. My mother punished me for making such a mess out of nothing. I believed in the devil. I believed my house was haunted. I believed I was haunted. A lot of these pieces serve as reflections on self-transformation or revelation, particularly with regard to aging and religion. Can you speak a bit to the personal journey that led you to write them? Some of these poems were written many years ago, and some are new. 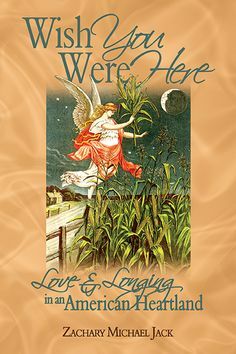 When I put this collection together I was pleased to see that the older poems blended well with newer poems to show this development of the self. The poems in my first book and my second book were written in a similar time span of each other. Some of the poems in Mud Song come from when I was working on the first book, but didn’t seem quite right for that book. Some of them were written during the time I was working on the second book, but again, didn’t seem to quite fit. Thus many of the poems in Mud Song, I’d felt are misfits, like me—not fitting into the books I was working on at the time. I’m always writing poems, and I have at least two books going at the same time. Although, really, most of the time I’m positive I have zero books going. When I write a new poem, I decide which “book” it should go in based on mood or subject or emotion. I became impatient with this book, which is now titled Mud Song, many times because it just kept feeling like all of the misfit poems. I couldn’t throw them away, though, because they contain so much of what keeps me alive, what keeps me breathing: mud, roots, trails, sand, my dog, birds, the sky. I kept putting all of the misfit poems in one document until I had enough to make a book. For me, it is the landscape that has transformed me, transformed the poems, it is the landscape that gave me a new religions, a new spirit, an acceptance of aging. The landscape lulls me forward. Because of your gender, your father offered to financially support your brothers’ college educations, but not yours. You’re now a professor of English at the University of Central Florida as a result of your own determination. How did you reflect on your relationship with your father while working on poems like “Drought,” where he takes center stage? The poems allow me a way to reflect on him, a way to try to understand his struggles. He had a great wit. He loved to laugh and make us laugh. He also had a militant style of discipline; I was punished many times with a razor strop. He cried quickly and yelled when we did something he didn’t like. For many years I was angry with my father, but poetry (and perhaps age/maturity) has allowed me to reflect on his own struggles—some I know of and others I don’t—and to include him in poems when the narrative calls for a memory of him or when a memory of him works as a metaphor in the poems. When I earned my AA degree, I danced on his grave. When I earned my BA degree, I drove to his grave and chatted with him. When I earned my MA degree, I felt sad for him. When I earned my MFA, I wrote “for Dad” on the back of the diploma. When I started teaching, I believed that he and my mother would’ve been proud of me. I still feel that. Mud Song is your third book of poems since 2011. How has your writing process evolved over the years? Are there other writers that have influenced your work? I never know how to write a poem, so I use freewriting, images, limitations, restrictions, lists, and prompts to get words on the page. Many times these end up simply being exercises to get my mind focused on writing, but most of the time, I can find a subject or image or line that will propel a new poem forward. When I first started writing, I would use a list of randomly selected words from random books on my shelves. Then I started using prompts and restrictions that I placed on myself, such as syllabics or use of color or not using particular words. Lately, I’ve been using images that I find online or art that I see in a museum. I don’t really write ekphrastic poetry, rather I use the images to find a way into a narrative that will eventually become a poem. Before I’d started college, at age 28, I had only read early Renaissance and Elizabethan poetry, which I’d read only because, one day after school, I’d snuck into the under-the-stairs closet at home and found an anthology of Renaissance poetry with my mother’s name written on the inside cover. I was fascinated by the rhythms and language. I didn’t think about those poems as influential until much later when I did start college. In college, I was introduced to many of the American Modern poets. But the one that changed my idea of what poetry could be was Sylvia Plath. When I read the poems in Ariel, I decided to try poetry. In addition to Anne Sexton and Sylvia Plath, I am influenced by many of the American Modern poets and the confessional poets. I try to read new books of poems by young poets as well as those I learned from early on in my poetry development. I read poetry, fiction, nonfiction, as well as hybrid works. Big influences include Laura Kasischke, Etheridge Knight, Gabriel Garcia Marquez, Dorothy Barressi, Lynn Emanuel, Catherine Bowman, David Wojahn, Mary Ruefle, W. S. Merwin, Edwidge Danticat, Tomas Transtromer, Adam Zagajewski, Julie Marie Wade…oh, there are too many to list. I’m currently reading Rochelle Hurt, Michael Dickmann, Terrance Hayes, Marie Howe, W. G. Sebald, Stephen Graham Jones, and Denise Duhamel. I discovered a book by Chilean artist Cecilia Vicuña, Saborami, that I’m going back to again and again. It’s grounded in place. She describes an art exhibit she created of just leaves. I feel at home in that book. Why did you choose the title for Because I Cannot Leave This Body? Titles for poetry are challenging because you want to entice a potential reader to be curious about the book but you don’t want to risk a reader thinking the title is literal. My first book with TSUP had the title Into the Arms of Pushkin: Poems of St. Petersburg. Some readers in Russia thought it was a book about Pushkin. It was not. Pushkin lived in St. Petersburg and so this was a metaphor for my time living there but it was confusing for Russian readers. After that I was more aware of pitfalls for titles. I wanted to be careful about the title of this book. 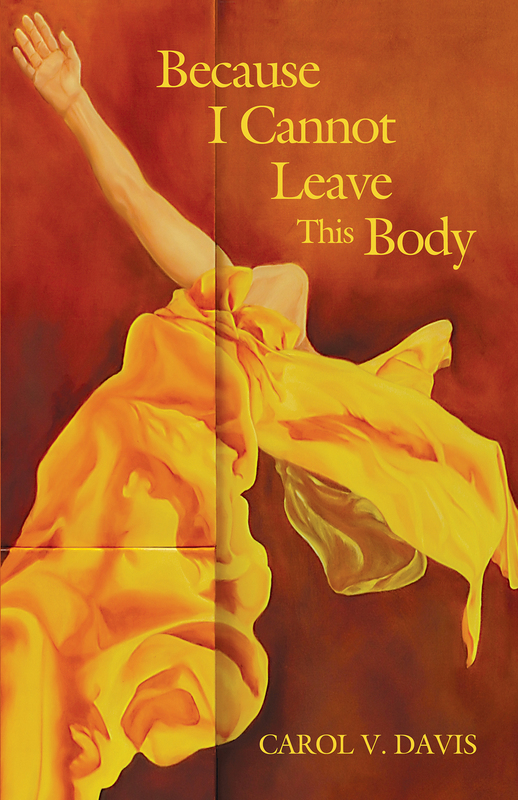 Since there are a number of poems that relate to the body, both in terms of response poems to paintings by Lucian Freud and other poems about the body, this title seems to work. I think it’s also an intriguing title. 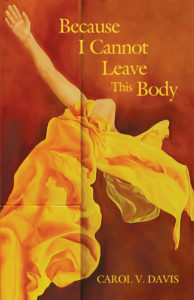 How does the image you chose for the cover represent the poetry in this collection? 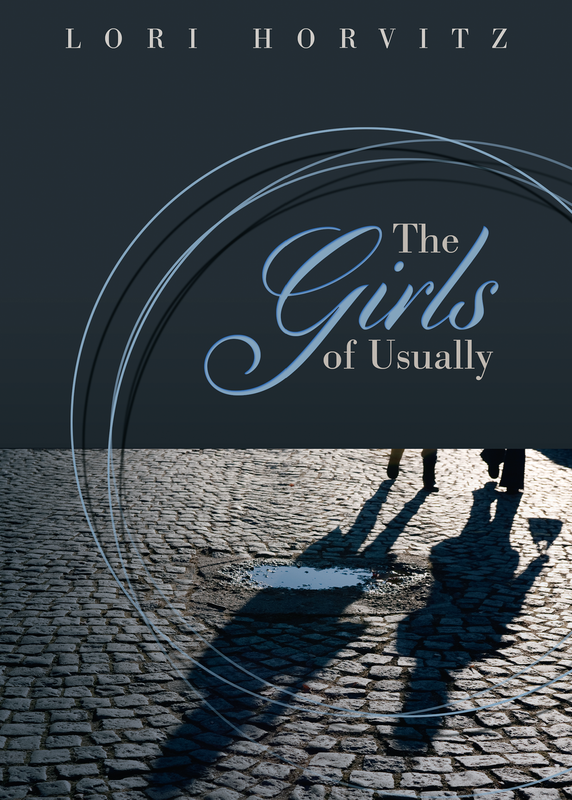 It’s so unusual and wonderful that TSUP allows and encourages its writers to choose the cover art. I’m not sure any cover actually represents the work in a book, but I do hope this painting works with the poems. I became acquainted with the paintings of this artist, Yvette M. Brown, about a decade ago and I love her work for its sense of movement of the people she paints and in the fabric of their clothing. Many of her paintings use bodies in motion and fabric/clothing in interesting ways. I like so much that this body (in the cover painting) is somewhat abstract, though it is partially representational in that you recognize the body but also cannot see the face. The figure is clearly leaning backwards but it’s not clear what’s behind it. There were so many things about this painting that worked beautifully, and especially with this title. I sent Yvette some of the poems from the book and we both looked at various paintings of hers before I chose this one. As you can see, there are some lines in the painting. This comes from different canvases she used. I like also this as demarcations of the body in the painting and think it works well with the poems too. Russia plays a huge role in your book Into the Arms of Pushkin, and this collection includes various settings, from Russia to California. What role do settings play in your poetry? I always respond to my environment and find being in new places inspiring. Like most poets, I pay attention to my surroundings in a more sharpened way when I’m in a new place than when I am at home, so this collection represents that as well. In 2010 I had a National Park Service artist residency at Homestead National Monument of America in Nebraska and that was a completely new environment for me. I had never been in Nebraska, never been on the prairie (except driving cross country as a child) and I found that environment very interesting. There are a number of poems from that experience and a second NPS residency in 2015 at Hubbell Trading Post on the Navajo reservation in Arizona. In January 2015 I went to Germany for the first time, and then back to St. Petersburg and on to Siberia, also for the first time. All of these experiences are reflected in some of the poems in the book as well. Part IV of this collection contains poems about paintings by Lucian Freud. What do you find interesting about his paintings, and what about Freud’s work inspires you in your work? I first saw the paintings by Lucian Freud many years ago. For over a decade he had a woman modeling for him who was given the nickname Big Sue. I knew for many years that I wanted to write about one of the Big Sue paintings, but it took (for some reason) many years to finally do it (this happens sometimes, when a subject just has to stew around until it is ready). Like many women, if I gain even a few pounds, I am self-conscious about my looks. (I used to be a dancer and danced in a company many years ago, an experience that probably makes a woman even more self-conscious.) I both admired Big Sue and was amazed that a woman of her size and girth would feel so comfortable in her body as to pose naked for many paintings. So I knew I wanted to write about at least one of these paintings. Once I started, I kept going and wrote about other Freud paintings as well. I find his work sometimes disquieting but it always grabs me as a viewer. There is, for me, something so strange and compelling about his paintings. Judaism and Jewish myth appear throughout this collection. How does your heritage influence your work? I can’t completely answer the questions about how exactly Jewish heritage influences my work but I do notice that this book has more references to Judaism and Jewish myths and texts than in previous work. It’s always been somewhat in my work but it’s more pointed in this collection. I grew up in a very Jewish household but there were a lot of unanswered questions. For my parents’ generation, I think they thought by not talking about difficult subjects, they were somehow protecting t heir children. So though I knew my maternal grandparents had left Germany, I also knew not everyone in the extended family had. But my parents never talked about it in front of us. That has haunted me and my work. When I was a toddler we moved to Europe so my father could work for the Marshall Plan. Even though I was so young, I remember living in many countries. 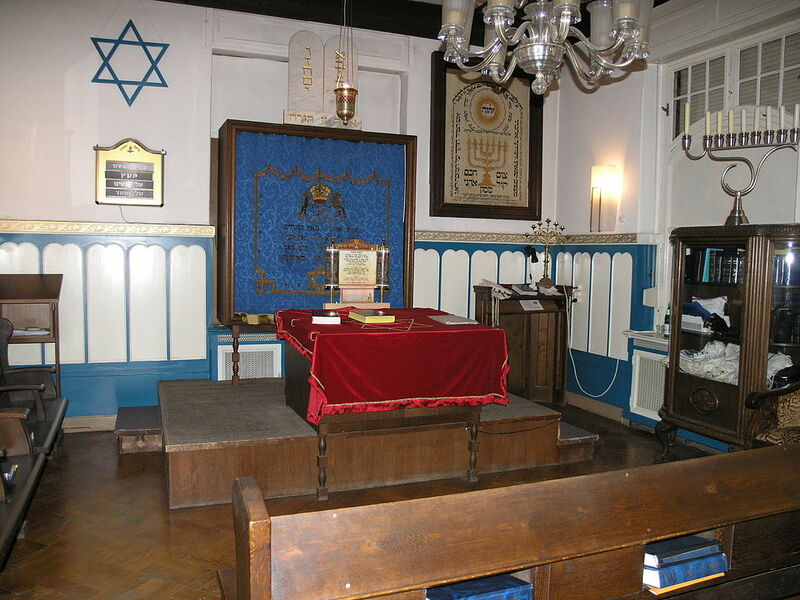 When I went to preschool in Europe and then in America and later again when we lived in England, I was often the only Jew (not to mention American) in a class and that somehow reinforced feelings of “otherness.” Some poems reflect that. Questions of faith and doubt have interested me for a long time and came to the forefront in this collection. Because I Cannot Leave This Body will be available in January 2017. Writing a title for a text that looks at the intimate moments of your life is hard to do. 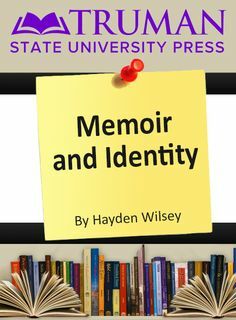 Why did you name your memoir “The Beginner’s Cow”? “The Learners’ Cow” is what I called the first memoir-type essay that I ever wrote. The circumstance under which I came to write it when I was nearly eighty years old will help explain why, later on, I chose “The Beginner’s Cow” for my book’s title. Mary, my wife of forty-seven years, had just died and I took it hard. I hadn’t cried very often in my life before this, I told a grief counselor, who then asked if I wanted to talk about one of those earlier times. I declined, but later found myself thinking about the time in my childhood when I had cried very hard. It was when our family finally sold Old White Face, one of our milk cows, the one my older siblings and I learned to milk on—our “learners’ cow,” as it were. She was an easy milker, a gentle cow, which is why she was assigned, in succession, to the you ngest, most recent child in our family to join the milking rotation. I bawled my heart out when I saw her hauled away. I wrote up the sad experience in an essay and showed it to the grief counselor, who encouraged me to continue writing. I heeded her advice and began to write the collection of autobiographical essays that would eventually become my book. “The Learners’ Cow” was then replaced with “The Beginner’s Cow,” a title that casts a broader perspective and connects the many beginnings throughout my life—from learning how to milk a cow to beginning the process of writing these memoirs. 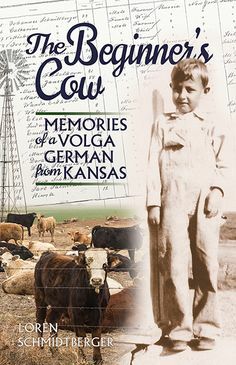 Your stories provide a lot of insights into your cultural roots as a Volga German growing up in Kansas. 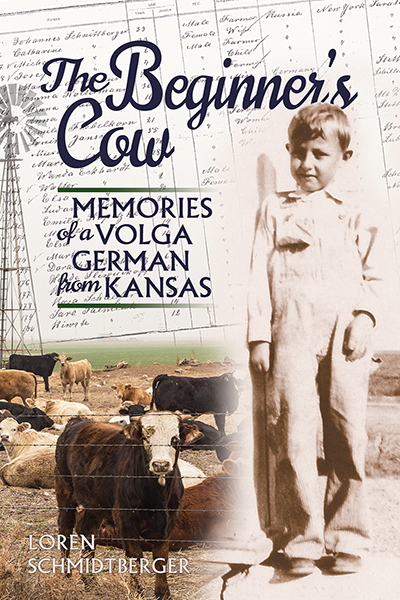 What did your Volga German heritage give you to think about as you wrote your memoir? My Volga German heritage was not something I specifically set out to mine while writing the essays that became this book. I did not try to illustrate the traditions, Roman Catholicism, for example, and practices that were especially dear to us Volga Germans. I just tried to create an accurate representation of events in my life that I can still recall and that might be of interest to a reader. In my earliest memories of ethnic identification, I first thought of myself as German, that being the language I heard and spoke more often than English. Then I thought of myself as German-Russian, or just Russian. I heard people from outside our community mispronounce it derisively as “Rooshun.” So at the time that I was first experiencing my Volga German heritage, I felt embarrassed and apologetic about it. Then in college I became defensive about it. Then, probably during my three years in the military, I lost all sense of ethnic heritage in defining myself. Through much of my life I simply defined myself as husband, father, professor, and in that order. In the course of writing my essays, I discovered that, for all the years I have lived in New Jersey and New York, I am still, at heart, a Volga German from Kansas. You taught for fifty-one years at Saint Peter’s University in New Jersey, where you are professor emeritus. What was the biggest lesson you learned as an educator? Listening is an undervalued form of communication. You are not listening if you are talking. Don’t take yourself too seriously. No child ever dreams of becoming president of the faculty senate. 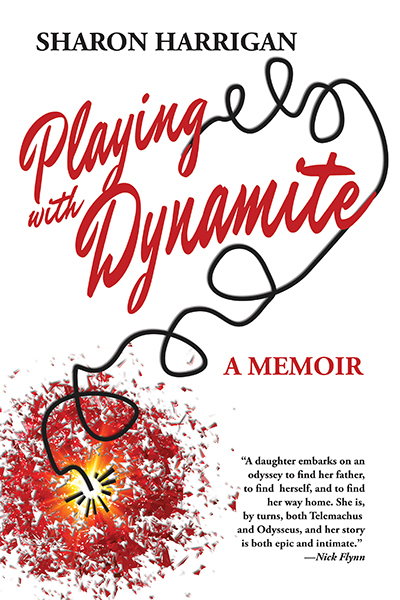 Now that you’ve written your memoir, what is one piece of advice you would give someone who is interested in writing their own memoir? Don’t start tomorrow. Start today. And be sure to back-up your document, indicating the date and a few-word-description of its contents, into a folder. You let your readers in really close to some important moments in your family’s life, memorializing your siblings and parents by writing about them. Did any of them get to read parts of The Beginner’s Cow as you worked on it? What do you think they would say about The Beginner’s Cow if they read it today? Glad you asked. My parents would be proud, I am sure. Only Jean, the oldest sibling, died without being able to see any of the essays. She would have loved them. From the beginning, I sent many of them to my siblings. My sister Alvina, who died in 2009, saw only the first few, but that included the one in which I quoted extensively from her own memories about our dad. I recorded “Penance on the Prairie” on a cassette for her, along with a harmonica solo by me—she was herself a good player—and her children played it for her at the hospital in Oregon. My sister Armie lived to read a few dozen. She too got treated to a CD and a song we used to sing in German. The staff in her hospital in Seattle enjoyed it too. Armie herself had sung a beautiful soprano. Virgil and Alvin read all the ones set in Kansas. They relished them. Alvin was mostly blind at this point, so his granddaughter Amy read them to him. She really liked them too, as did Virgil’s son, Gary, who still urges me, from time to time, to “Keep writing!” My sole surviving sibling, Janice, read and made some very astute suggestions about the manuscript, which I adopted. 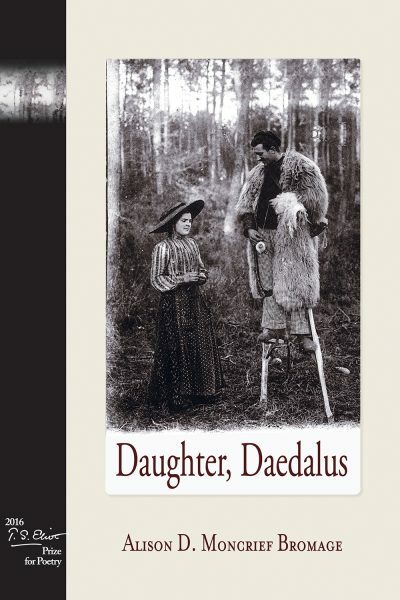 Daedalus is a recurring character throughout your T. S. Eliot Poetry Prize–winning collection, Daughter, Daedalus. What role does myth play in the creation of this collection? What does mythology offer you as a writer? 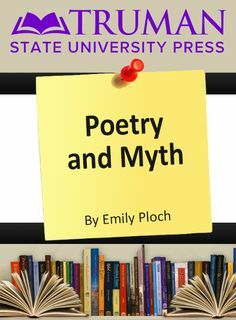 Myth plays a large role in this collection as both a platform to spring from, as in the case of the Daedalus poems, and as a compelling voice to inhabit. The last section of the book is a sort of creation myth. Writing in the form of myth grants a narrative gravitas and a timelessness, and it is with that tone that I wanted to explore ideas of creation, motherhood, and the physical world. What is it about myth that you are drawn to? What is it about Daedalus specifically that interests you? The outlandish logic of myths attracts me. The proportions of cause and effect are so skewed and subjective in them, and I find that liberating. In myth people die of heartache, barter with kings, and invent folding chairs as huge responses to small conflicts. The power of the archetype is compelling; we can relate to both the hearthkeeper and the lord of the underworld, to both vengeance and love. Daedalus, however, is not a god. He is simply a man of invention, a tinkerer. I come from a family of tinkerers who have a sense of optimism about jerry-rigging things like car engines, sump pumps, and doorjambs. So I feel at home with Daedalus’s resourcefulness. I also have great respect for his inventions. The ship’s sails, its prow, and a dancing floor are all inventions that seem to have granted Daedalus both social grace and isolation, which I find intriguing. Have you always been attracted to mythology? What originally enticed you about myth? I was always interested in stories and storytelling, like any child. It wasn’t until high school that I actually read Edith Hamilton’s Mythology. I remember raising my hand in freshman English class and asking the teacher, in all honesty, whether the stories were true or not. (It was the story of Prometheus that gave me trouble. I couldn’t get my head around how his liver would regenerate overnight.) At thirteen, I had not yet learned to discriminate between the stories of what actually, historically happened and the stories people tell one another to explain things. Having a capacious imagination and being raised Catholic helped my curious confusion, I am sure. Here’s the power of myth for me as a poet: I am still challenged by that line of reality and fabrication. Inspiration to write comes in many forms. Who are your muses and teachers in creating poetry? Did you lean on any specific person or influence for Daughter Daedalus? Inspiration for the poems in Daughter, Daedalus came namely from an absence. I had a sort of animal longing for a child for several years, and it took a long time for me to get to meet our daughter. So motherhood, the inverse of it, and my children are all wellsprings that helped to make these poems. The physical world, its starkness and its natural laws are also inspiration to me—I think physics and the laws of gravity and heat are actually poems. When several of these poems came to me, I was driving through northern Vermont for work and listening to the Great Courses lectures on classical mythology. I drove alongside the Lamoille River and its boulders on my way home to Lake Champlain. The harshness of that landscape and the wending tales of gods and half gods percolated in me and the poems started to come. I kept a pad of paper on the passenger seat and wrote fragments as I drove. And of course, I am a student of many brilliant poets and have certainly leaned on the buoyancy of their work: Seamus Heaney, Selma Hill, Sylvia Plath, Linda Gregerson, A. E. Stallings, and Mary Szybist, to name a few. Your works appear in a lot of different literary journals. How did publishing in different journals help you in putting together this collection? I started out years ago submitting maybe five poems, two times a year—and only to the most exclusive literary journals. And I was surprised and disappointed when six months later I was always rejected. My ego was too involved and that limited the lives of the poems. Recently, I just submitted everywhere like crazy. My son was an infant and submitting felt like the only way I could be connected to the poetry world, because I wasn’t writing. The result of that push was that I got many poems published, in a variety of online and print journals. I got a lot of really terrific feedback from editors—great edits, great rejections, and other submission suggestions. The lesson for me was that for the poems to live, they need to be in the world. The process of submitting requires some good poetic housekeeping and I am sure that that organization helped shape this collection. Lots got cut as I went along and the arc of Daughter, Daedalus became clear to me. What revelations do you hope readers will have with Daughter, Daedalus? What did writing these poems reveal to you through their creation? I always seem to write poems in a series and because of this, am never quite sure how the individual poems from a series will stand alone, or how they will stand with other series. Daughter, Daedalus is a combination of four series—apostrophes to a Daughter, to Daedalus, a portrait of limbo, and the voices of twins. Sort of an odd set. But I realized when I spread the poems out on a long table that my preoccupations held them together as a singular narrative. I hope that readers will come to know Daedalus as I did—that in turning to the archetypal father of invention, I was too was inventing. Here now was a god to speak with and with whom to find relief, and he was my creation. I hope readers find conversation and relief and some nuggets of curiosity in the collection. I hope they feel, as I do, that there’s so much mystery to behold. When I first came to Kirksville, some of the first stories I heard about the town and the school had to do with ghosts and the supernatural. There is a ghost that haunts the dorms. There is a ghost that haunts the memorial building. There are ghosts that haunt downtown. 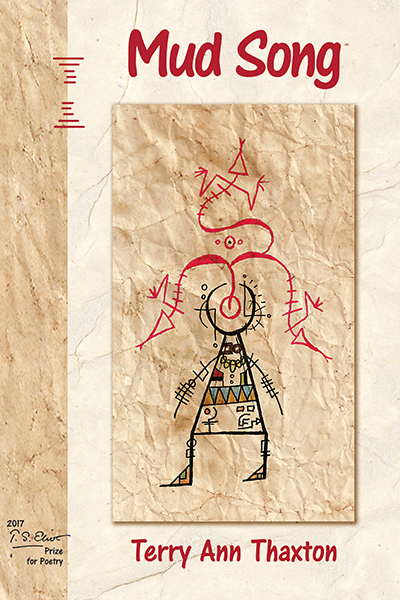 Some of the stories depict these spirits as protectors, most notably the ones who live in the dorms. Others are depicted as the scary beings that are often featured in horror films. Regardless if you believe in them or not, these stories hold value. Our interest in the paranormal is more than just a quick thrill to keep us up at night. It’s an attempt to name the scary thing lurking in the shadows. It’s a way to give an explanation to the things we don’t understand. As humans we are always trying to find answers to the things we don’t know and strive to discover what is left to discover. Even those who don’t believe in ghosts still try to give explanation to the random creeks in the floor and the faint silhouettes of light (even if their explanation is that you’re just imagining things and you need to get some sleep). 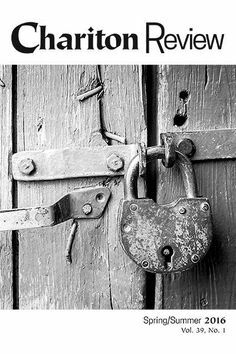 One of the more famous ghost stories of Kirksville that has gained national interest involves the “dibbuk box,” a wine cabinet haunted by a malicious spirit who torments anyone who has the box in their possession with nightmares, health ailments, and the smell of jasmine flowers and cat urine, giving those who have the box the heebie jeebies. The box made its way from Spain, after being purchased from a woman who survived the Holocaust, to Oregon, when the woman immigrated to the United States. The box was then sold to an unassuming antique buyer-refinisher who went to eBay with several stories relating to the box that helped him come to the conclusion that the box might, in fact, be haunted. A student in Kirksville bought the box from there but it didn’t take long before it was sold again to Kirksville resident Jason Haxton. Haxton, the only person who knows the current location of the box, recounts the terrifying stories surrounding the box and his attempt to put the spirit back to rest in his book, The Dibbuk Box. The story of the dibbuk box was adapted into a movie, The Possession, in 2012. The ghost stories and folklore surrounding this city seem to be something ingrained in towns all over, at least in Missouri. 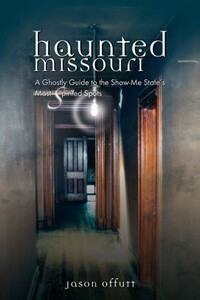 In Jason Offutt’s book, Haunted Missouri: A Ghostly Guide to the Show-Me State’s Most Spirited Spots,his collection of ghostly encounters in thirty-two different locations throughout the state are truly haunting. While he visits each location, he gathers testimonials from workers, residents, ghost hunters, and others who have had experiences with the spirits. My favorite story in the collection is from the Lemp Mansion, a St. Louis hotspot for hauntings, where Offutt walks into a cold spot from a spirit on the third floor, the floor with the most accounts of haunting. If you’re interested in supernatural stories, you should also check out What Lurks Beyond: The Paranormal in Your Backyard. School breaks are an ideal time to visit new places and go on adventures with family and friends. Unfortunately, finances and other time commitments can make it difficult, if not impossible, to go the places on your bucket list. That is where publishers like Truman State University Press can save the day. But aren’t scholarly publishers associated with serious academic study and not with entertainment? So how can a scholarly book help you see the world? It’s quite simple really—through history. Last year, I studied abroad in Ireland and had the chance to visit cities I had previously only read about. Each place is culturally rich in its own way, and it was nearly impossible to cram in everything we wanted to see during our brief time in each place. One thing that all of these cities offered were free walking tours led by locals who knew tons and tons about their hometowns. And how do you think our tour guides learned all they knew about the cities they were guiding us through? By studying the city’s history, of course. There’s a difference between reading about the history of a place and actually going there, but a good history book might be able to satisfy the travel bug while you save up for your next adventure. Take, for example, Federico Barocci and the Oratorians: Corporate Patronage and Style in the Counter-Reformation. If you dream of visiting Rome and you have a passion for Italian art, this book would give you a glimpse into Barocci’s works and style during the sixteenth century. If you go to Rome, it would cost around $2,000 just for the plane ticket. The book, on the other hand, costs only $60 ($49.99 for the e-book). I know this approach to travel can work because this is exactly how I handled my obsession with Ireland before I went there. I read about Bloody Sunday and other events in Irish history. I immersed myself in Irish literature, falling in love with the works of Yeats, Wilde, and Shaw in the process. Not only did my love for the location grow, but I also understood and appreciated the places I visited that much more. Walking through Belfast was much more meaningful and solemn thanks to my understanding of the city’s past and present turmoil. Seeing the west coast of the Republic made the words in Yeats’ poem “I am of Ireland” resonate that much more. If I had not read about the country before going over there, I could not have appreciated my time there in the same way. History books also allow people to travel in time. By reading a history book, you can jump from era to era and have a taste of what society once was like. Since time travel is currently only possible in science fiction, we should take advantage of what history books have to offer. Whether it is actual travel or time travel you seek, I thoroughly believe reading history books is one of the best—and most inexpensive—ways to get started. Learning about a location and its past can be one of the most enriching things someone can do. Adventure is out there wherever you look, including page one of a history book. So grab a book and start your next adventure today. Truman Capote, in the popular In Cold Blood (Random House, 1966), thus sets the mood of uneasiness that descended on a small town in Kansas following a quadruple homicide. In Cold Blood is one of the first, and certainly one of the most well-known, works from the genre of true crime. True crime books are a unique blend of factual events blended with elements of fiction (e.g., suspense). The purpose of true crime is to create a work that, through conventions of literature, can create a strong emotional connection to readers, thus helping others better relate to real people and actual events. The use of the word “final” in this conclusion to the book’s first chapter creates suspense through the use of foreshadowing, a common literary tool of fiction. The reader becomes hooked. We know that the colonel is doomed—but how will he meet his end? The fact that the true cause of death for the colonel and two family members remains unknown to this day only adds a greater sense of suspense to this and similar works of true crime. We cannot help but try to figure out “whodunnit” as we read; true crime books, especially those dealing with unsolved cases, allow us to act like Sherlock Holmes, making us more involved in the story. As actual events unfurl in Deaths on Pleasant Street, we grow more familiar with real figures from a bygone era who could be very similar to people we know today. Many of us probably know someone like the “love-smitten” Frances Swope Hyde, who refused to leave her dearly beloved husband when she learned of his cruel behavior toward others, and even when later he is accused of murder. So why does it matter if we can relate to people involved in criminal cases. And isn’t it morbid to be so interested in real murders? We can surely get the same entertainment value from watching Criminal Minds or CSI and we wouldn’t, as some would claim, be romanticizing violence. But true crime books, such as Deaths on Pleasant Street, that get us invested in actual crimes, allow us to see victims and perpetrators alike as human beings. Being constantly bombarded by sensational news headlines and too many images of dead bodies displayed as props on the screen can desensitize us to horrific events. We don’t have time to stop and think, “Dear God, that was a human being.” But those dead bodies aren’t props and the perpetrators were probably once somebody’s beloved child. They were people with complex personalities and unique experiences that brought them to that brief moment when we see them on the news. True crime fascinates because it satisfies our need to see the complexity in our fellow human beings and changes our perceptions of humanity, allowing us to see people as capable of being both kind and gruesome. It is tempting to split the world into black and white, good and bad, to save ourselves emotional pain. But most people aren’t split so cleanly into such dualities. Acknowledging the complexity of others can help us reevaluate how we act toward those around us. It might even help us to recognize warning signs from someone who could become violent. In this way, true crime doesn’t just appeal to us as mere entertainment—it draws us in because we are fascinated in learning about others and ourselves.